Fermentation as a cooking and preservation technique has been long forgotten. We’re bringing back fermented foods to celebrate the multitude of positive benefits. The Brinery, our first product, overcomes health and environmental issues by coupling a physical vessel to an intelligent digital guide. 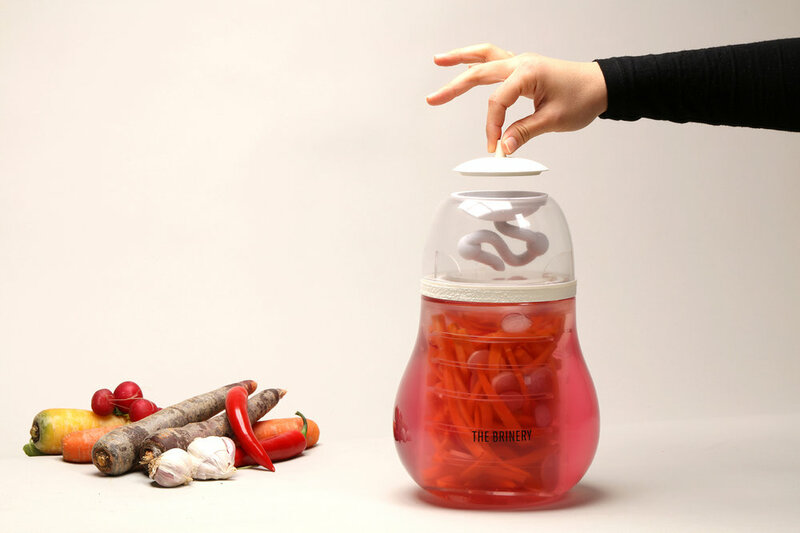 The product is an at-home fermentation vessel that creates the right environment for fermentation to spontaneously occur, while minimising it’s complications. We are in the works of developing The Brinery. Check out our updates here. Reintroduce the process of food fermentation, as a nutritional support and food waste leverager, into modern households. By rebranding the narrative around fermentation, and introducing both physical and digital tools to help create, manage and succeed in fermenting foods easily, we intend to bring back what has been an essential food preservation technique and nutritional source for millenia. We use a design centred and user-focused methodology that always starts with the user and engaging with them at every stage of product development. We have already run several early, low fidelity user tests to gauge the effectiveness of our proposed product and digital assistant. The early results have been very promising with most users showing an enthusiasm to continue fermenting after the user tests were done. We require more development and higher-fidelity prototypes to gauge the reliability of our proposed technology. This has allowed us to identify two milestones in the standardisation of at-home food fermentation. Firstly, communicating the benefits - both for health and environment - of the fermentation process and reframing the narrative for a younger, more dynamic and urban user are key aspects. Secondly, there is a need for better tools for non-experts: physical products that are more user-friendly, engaging, and guidance that lives up to consumers’ expectation of convenience. In the last few decades, it is believed that we have lost much of the microbial diversity in our gut and this has had a direct influence on the rise of lifestyle diseases such as allergies, Irritable Bowel Syndrome, and Celiac Disease among many others since probiotic bacteria can significantly improve both digestive and mental health. Recent scientific studies are showing how crucial our gut microbiomes are to our physical and mental health, and how this fragile ecosystem can be directly jeopardised or boosted by our diets. It is estimated that we have lost over a third of our microbial diversity in the last century due to a significant decrease in fermented food consumption and an increase in pasteurised, preservative-rich foods. It is currently estimated that over a third of all the food we produce globally is wasted, partially because of food supply chain management issues and partially because of consumer behaviours towards food preservation. By encouraging fermentation at home, we contribute to food waste reduction on many levels. We will create a zero-waste system by encouraging users to ferment food scraps - i.e. watermelon skins or spring onion stems - into naturally carbonated drinks and pickles. At-home fermentation can induce, on a global scale, a shift in consumer attitudes towards the way they preserve, cook and consume food.